Fathers are fantastic individuals who would do anything for their kids. They teach, love, scold, care for, and support their little ones, and even with all the hugely variating parenting styles out there, they make wonderful role models and will go the extra mile for their children – even if it means potentially completely embarrassing themselves! 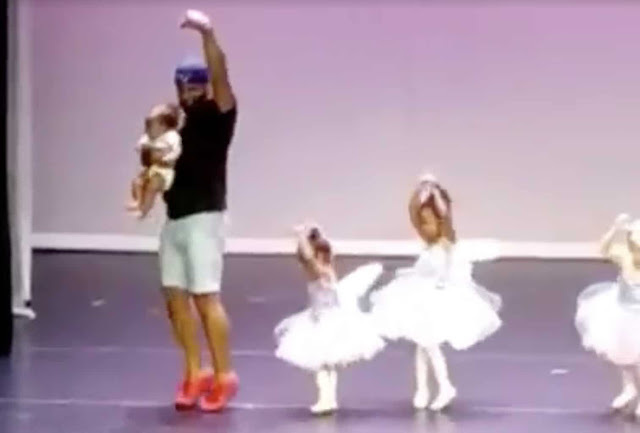 At the Motion School of Dance, located in Watertown, New York, a young girl was performing a dance routine on stage with some fellow tiny dancers. But she was completely stumped and had forgotten her moves, leading to her feeling confused and frightened on stage. Luckily, her dad was in the audience and ready to help! The dancer’s dad rushed onstage, cradling a younger baby in his arms, and began to help her remember her moves – and not by asking her to think or relax, but by demonstrating them himself so she could follow! Apparently, as the girl rehearsed at home, her dad had remembered and learned every single one of her dance moves! 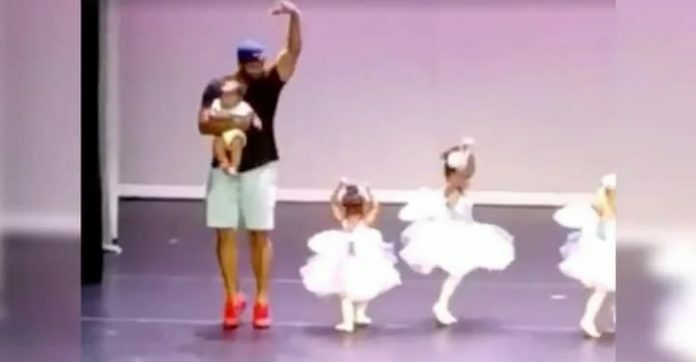 With her father helping along, the girl slowly gained confidence and followed in her father’s footsteps – or, rather, dance-steps! The dad didn’t seem to mind looking silly in front of the crowd. He just wanted to help support his daughter and bring a smile to her face!